After his history was rewritten by the sentient, Hydra-loving Cosmic Cube known as Kobik, Captain America killed a few beloved heroes in the name of the fascist regime. But the deaths of Jack Flag and Rick Jones, however popular they may be, don’t carry the same weight as Natasha Romanoff AKA Black Widow. In the pages of Secret Empire, the long-time Avenger changed the outcome of the Ultimate Spider-Man’s predetermined fate to murder Captain America and jumped into the fight in the nation’s capitol, which resulted in her neck being broken. 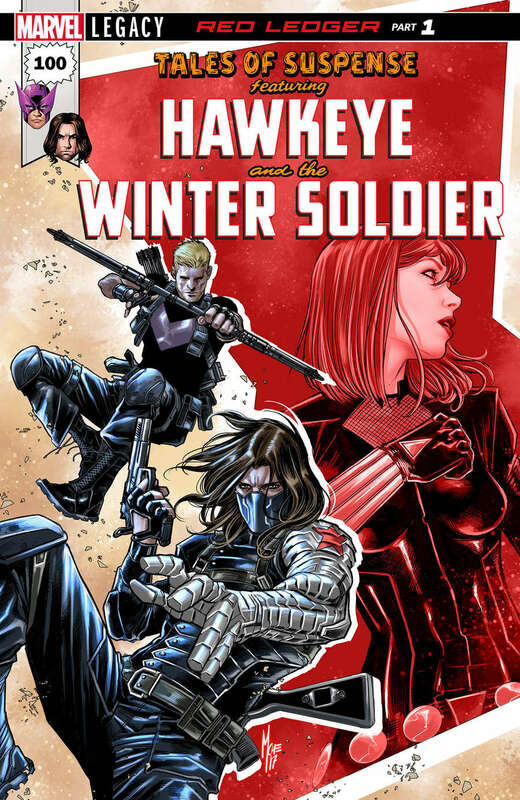 However, a new comic released as part of Marvel Legacy will explore that fate and whether or not she’s really dead, focusing on the Winter Soldier and Hawkeye’s attempts to solve the mystery. Tales to Astonish was announced on the new Inside Marvel program, a new streamed segment hosted by ABC News. Brevoort announced Tales of Suspense #100 by Matthew Rosenberg and Travel Foreman would be launching in December with Bucky Barnes and Clint Barton attempting to learn more about what is going on. Slide 1/2 – Is Natasha Romanoff REALLY Dead? In Secret Empire Omega, the world mourns the death of the Black Widow after her highly publicized death. During her funeral, Hawkeye can barely come to terms with Natasha’s passing and has to be escorted out by Old Man Logan and Mockingbird. The Winter Soldier watches the funeral on a television in Madripoor before shaking down an informant who knows about an assassination attempt in the country. He learns that a Hydra-alligned military general is giving a speech to the people in hopes of currying favor before elections, and ends up getting gunned down in public. The comic will pick up from those events. “It’s Hawkeye and the Winter Soldier each in their own way, on their own trajectory, sort of on the trail of Natasha’s ghost,” Brevoort said of the series. The series will be an “anti-buddy book” as both characters invest who his killing the Black Widow’s enemies. Slide 2/2 – More Tales of Suspense! Black Widow first appeared in the pages of Tales of Suspense #52 when the title featured Iron Man. It ran until issue #99, with the later half of the issues featuring Captain America in a “split” comic with Iron Man. It was renamed “Captain America” for issue #100. As a part of the Marvel Legacy promotion, the publisher is reviving the original Tales of Suspense title right at issue #100, picking up where it left off almost 50 years ago. Check out the solicit for Tales of Suspense #100: “The Red Ledger - Part 1” will be available in December.